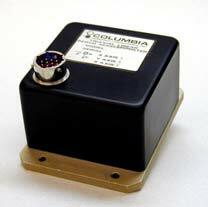 The Columbia Models SA-307TX and SA-307HPTX are force balance accelerometers capable of measuring DC and low frequency acceleration simultaneously in three axes. These sensors are self-contained and provide a high level, low impedance output. No additional signal conditioning is required in most applications. The Model SA-307TX is a low cost design and is well suited for many OEM and general-purpose industrial applications. The Model SA-307HPTX incorporates Columbia's patented "HP" torquer design providing improved accuracy and repeatability in adverse shock and vibration environments. Consult the factory for customized versions of these sensors. Exports of accelerometers from the United States are subject to the licensing requirements of the Export Administration Regulations (EAR) and/or the International Traffic in Arms Regulations (ITAR). +0.02% / Deg C Max.